If you are lucky enough to live in Colorado then you understand that we live in one of the most beautiful places on Earth. Fresh-air, Rocky Mountains, white-rapid rivers, sunny days, sparkling snow fall, crisp rain, vast colors of leaves and flowers; the beauty is endless. We get the best of all four seasons and sometimes all in one day. It is often difficult for your skin to acclimate to changes in weather at times leaving it dry, dull, weathered and worn. Whether you are new to Colorado or a native like I am, the arid climate and weather conditions effect your skin no matter what, but there are ways to care for these issues in order to restore and balance the wellness and youth of your skin. Exfoliating is mandatory when dealing with dry and dull skin. It also helps to increase your cellular turnover rate. There are a couple of important things to note when exfoliating. Do not exfoliate every day, because you don’t want to strip the skin of its natural oils! You should only be using your exfoliator 2-4 times a week (personally, I do every other morning); start with 2 times a week, then build your way up to 4 times. Another thing to note is to not use drugstore brand “facial scrubs”. This is so important because these products can worsen your skin issues like make enlarged pores worse, cause redness, and scratch and tear the surface of your skin. They contain alcohols, binders and fillers that can dry out your skin even more. My go-to exfoliator right now is the Cranberry Gommage by ARCONA. This is an award winning formula that has all natural exfoliators such as jojoba beads and volcanic materials to gently decongest enlarged pores and slough off dead skin cells. It also has Cranberry, raspberry and blueberry enzymes to effectively promote exfoliation. It contains antioxidants and anti-aging ingredients to reduce free radical damage, leaving your skin feeling so smooth and polished! Hydration is SO important to maintain the health of your skin ESPECIALLY in higher altitudes. When you are dehydrated, it physically shows in the appearance of your skin. Water is evaporated out of your skin much quicker in Colorado than in humid climates. Cut out all those sugary drinks (especially soda) and replace them with lots of water and you will start to see lots of positive changes in the health of your skin. NO LIE! Make sure that your serum and/or moisturizer has it. Hyaluronic acid is a natural humectant that is present throughout your body; meaning it draws and locks in moisture and helps your skin cope with dry climates. One of my favorite products that we sell at Elixir that has Hyaluronic Acid is the Hydrating Serum by ARCONA. This is a hydrator that reduces dehydrated and depleted skin by replenishing lipids lost due to aging, stress and environmental damage. This serum also contains Phospholipids & Sphingolipids (more hydrating/moisturizing ingredients), Manuka honey, vitamins & minerals and amino acids. It’s like they made this serum specifically for Coloradans. This rule is so important that it should be #1. WEAR SPF! Everyday, all day (yes, reapply throughout the day) and all year ‘round. Especially in Colorado because we are closer to the sun and its’ radiation. The sun is no joke and without proper protection it will cause sun spots, hyper pigmentation, damage to cells and cancerous cells. Even if it’s not sunny and warm outside, the sun’s UV rays will still damage the skins DNA. Some people do not like the way that SPF feels on the skin but you just have to find the right product with SPF. At Elixir we have 2 different SPF moisturizers that are amazing (tinted & non-tinted).They are non-greasy formulas with titanium dioxide & zinc oxide for UVA/UVB protection. They are lightweight and help to not only protect, but to prevent future sun damage and also provide antioxidant ingredients. We also sell a product called Desert Mist which is a unique protective barrier for the skin. It defends against environmental damage, pollution, weather, high-altitudes, and chemicals and reinforces daily hydration. It locks in all of your products from your AM regimen and also acts as a non-silicon make-up base. Not only are facial treatments extremely relaxing and stress relieving, but they are so beneficial for your skin’s health. Your Elixir skin care professional will analyze your skin and its conditions, and see which ingredients your skin is being deprived of and what products your skin needs. Some treatments include high percentage of special ingredients that you cannot buy over the counter and will only be able to receive from a specialist. 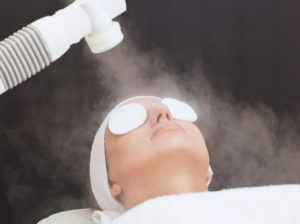 Regular treatments help to balance skin, reduce stress and inflammation, prevent breakouts, decongest, and prevent aging. Make sure that you know and understand the products that you are putting on your skin and make sure you aren’t using any harmful ingredients that will strip your natural oils. Have a trustworthy skincare line that you can count on for your individual needs. Everyone has different skin types and conditions and it is important to use products that will benefit you specifically. At Elixir we use ARCONA which is a high quality cosmeceutical line from Los Angeles established in 1989. They do not use any petrochemicals, binders or fillers, chemical stabilizers, parabens, sodium lauryl sulphates, perfumes or dyes, or any other caustic, toxic ingredients. ARCONA is a natural brand but also has lots of active and corrective ingredients. All of these ingredients are beneficial and work synergistically with your skin cells. With a proper AM & PM regimen using ARCONA’s Basic Five, your skin cells start to turn over every 7 days leaving your skin extremely fresh, revived, healthy, and polished! Normally your cells turnover every 28 days, so you could imagine how lots of dead skin cells can get stuck on the face causing dryness, fine lines/wrinkles, and congestion. Using natural eucalyptus in your shower has many benefits. The steam from the shower will release the plants natural oils which are beneficial in many ways. Eucalyptus helps to soothe skin irritations while also helping with respiratory health, headaches and migraines and provides an aromatic, stress relieving spa-at-home shower. Following these steps will improve the overall dryness and well-being of your skin. If you have any questions or concerns about your skin, please feel free to reach out to Elixir and one of our skin care specialists will be glad to help you!